Meeruthiya Gangsters is a decent attempt from a debutant director, says Nishi Tiwari. Zeishan Qadri, who was born and raised in the Wasseypur town of Jharkhand’s Dhanbad district, was put on the Bollywood map after he co-wrote and starred in Anurag Kashyap’s ambitious crime drama Gangs of Wasseypur. His directorial debut Meeruthiya Gangsters presumably borrows a lot from his real life experiences from his college days in Meerut. Unlike GoW though, a two-part revenge saga that captured the imagination of Indian moviegoers with its swagger, grit, and rare authenticity, things seem to have been lost in translation in Meeruthiya Gangsters. With its witty exchanges, local flavour by way of dialogue delivery and generous use of action sequences set to zany music, the film can be easily mistaken for another Anurag Kashyap film. Only, unlike AK’s stories that are charged with a sense of earnestness and urgency, Meeruthiya Gansgters establishes itself as irreverent and laidback early on in the narrative, when a group of six friends hatch a plan to raise money to secure white collar jobs by resorting to criminal means. 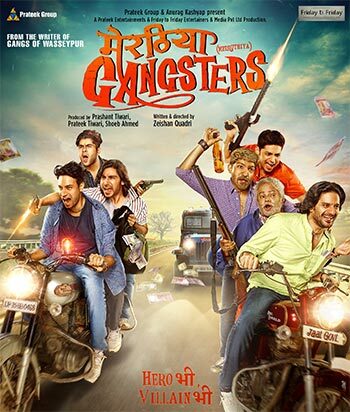 Gang leader Nikhil (Jaideep Ahlawat) and his boys -- Gagan (Vansh Bhardwaj), Amit (Aaksh Dahiya), Sanjay Foreigner (Jatin Sarna), Sunny (Shadab Kamal) and Rahul (Chandrachoor Rai) -- are students in the Meerut college but spend all their time in monkeying around with petty crimes. They graduate to more serious crimes like kidnapping, to get into real estate. While the film works in bits and pieces -- the snappy dialogues, the background score that takes centrestage periodically, the spunky women (there’s Gagan’s harrowed girlfriend Mansi (Nushrat Bharucha) who calls the shots in the kidnappings and Sanjay’s slap-happy wife-to-be (Soundarya Sharma)) -- the story struggles to establish its motive right till the end. Kind of like rebels without a cause, the protagonists effortlessly flit from one kidnapping to the next, like it’s that easy to pull them off, Qadri takes generous liberties in the story department just so it is all pieced together haphazardly in the end. There’s Sanjay Mishra, in a guest appearance, who flits in and out of the film just as randomly as its proceedings, while Mukul Dev, as a cop, hides his histrionics behind facial fuzz and dark aviators but is effective in many scenes. If you loved the Gangs of Wasseypur movies, you’ll find Meeruthiya Gangsters engaging in parts. Not a bad attempt at all for a debutant director.